was brought to comic books in 1970, when Marvel Comics licensed Conan from the Howard estate, and has been part of the comics scene ever since. Tho Marvel has been the most prolific exploiter of the style, the other comic book giant, DC, hasn't completely ignored it. 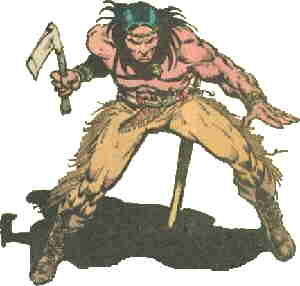 DC's most successful barbarian hero was Arak, Son of Thunder. Arak was first seen in Warlord, another swordfest (but this one starring a modern American in an inner-Earth world full of dinosaurs). The 48th issue (August, 1981) featured a 16-page free insert previewing the new series, a promotional ploy DC used several times during the 1980s (as when the first new "Dial H for Hero" story was inserted into Legion of Super Heroes #272, and when New Teen Titans was previewed in DC Comics Presents #26). The story told of an attack that wiped out the Quontauka, a tribe living on the East Coast of North America, in the 8th century CE. Its sole survivor, an unnamed 10-year-old boy said to have been favored by He-No, the Quontauka god of thunder, drifted out into the Atlantic Ocean, in an open birch-bark canoe. The story was continued in the first issue of his own comic, which came out the following month. He was rescued by a band of Vikings, traveling far west of their usual haunts. They named him Eric, which he pronounced "Arak", and raised him as one of their own. He grew into a powerful warrior, skilled with both the Viking sword and his own tomahawk. In the second issue, his Viking companions wiped out as a just result of their own ruthlessness and rapaciousness, he went off seeking the court of Carolus Magnus (Charlemagne), whom he continued to serve for the rest of his life. The series was created by writer Roy Thomas (who also co-created DC's Infinity Inc. and Marvel's Invaders) and artist Ernie Colón (whose credits range from Amethyst, Princess of Gemworld to Damage Control to Jackie Jokers). Thomas remained writer on the series throughout its run, but Colón left after a year. Several artists drew it after him, most prominently Tony DeZuñiga (Jonah Hex, Black Orchid), who had inked Colón's work at the beginning. In #33, seeking his American roots, Arak was killed. But, like many deaths in comic books, it didn't last. After a direct meeting with He-No himself, he was resurrected, and thereafter functioned as both a physical warrior and a mystical shaman. The comic lasted 50 regular issues and one annual, ending with a cover date of November, 1985. Four months later, he made his only crossover into the mainstream DC Universe, in a time-traveling adventure with The All-Star Squadron (the group that included most DC-owned superheroes active in the 1940s). Since then, the character has remained dormant. Text ©2003-07 Donald D. Markstein. Art © DC Comics.